Granddad's war stories - An introduction. There’s a cliché in the psyche of people my age (mainly courtesy of the lovable Uncle Albert from Only Fools and Horses) that elder relatives’ tales of war are – without exception – boring. I tacitly bought into this, until recently re-discovering my granddad’s writings, 10 years after his death, and 20 years after I was first given them to read (but ignored them in favour of something by Roald Dahl). So, I’m going to transcribe them into blog format – a chapter every Friday – in the hope that more people discover just how interesting, dramatic, and (as I hope the 1st series will show) funny these stories can be. And it’ll also serve to get them into a nicer looking format than the awful fake-handwriting-typewriter-photocopies-covered-in-scribbles that is the only form they currently exist in. All posts will go in my shiny new “Granddad’s war stories" category, so you can catch up at any point (should be a link in a the sidebar). The first series is a lighter, funnier piece he wrote for family. i.e. No gory bits. 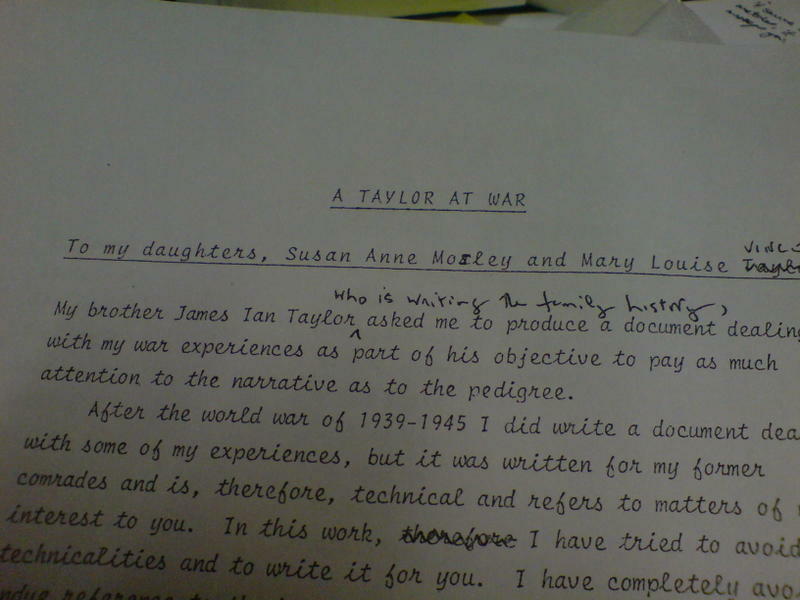 It's called 'A Taylor at War' (My Granddad's name was Robert Francis Neil Taylor - he got an OBE and was an all-round legend really). I'll do the preface tomorrow and crack on with chapter 1 next Friday.